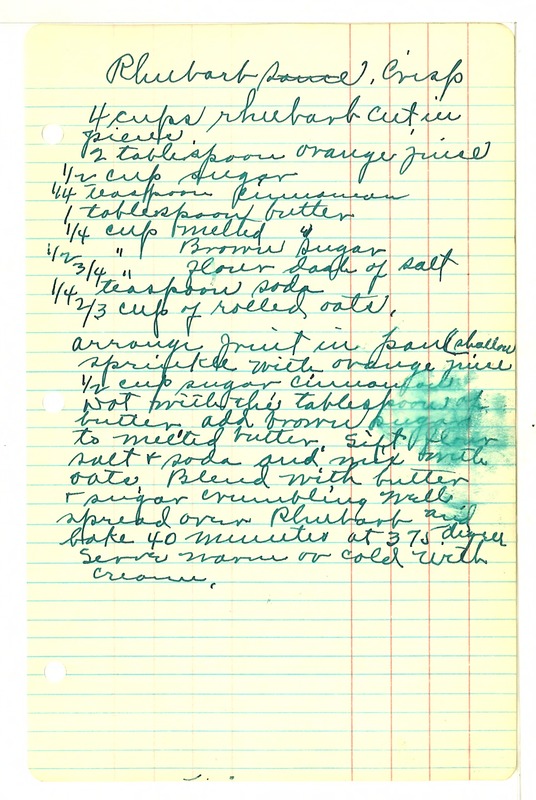 Rhubarb Crisp 4 cups rhubarb cut in pieces 2 tablespoon orange juice 1/2 cup sugar 1/4 teaspoon cinnamon 1 tablespoon butter 1/4 cup melted " 1/2 " Brown sugar 3/4 " flour dash of salt 1/4 teaspoon soda 2/3 cup of rolled oats. arrange fruit in pan (shallow) sprinkle with orange juice 1/2 cup sugar, cinnamon Dot with the tablespoon of butter, add brown sugar to melted butter. Sift flour salt & soda and mix with oats. Blend with butter & sugar crumbling well spread over Rhubarb and bake 40 minutes at 375 degrees Serve warm or cold with cream.